One of the things that will likely be a big feature in the development of online poker in the United States is the level of diversification a site provides between different states. Different parts of the country have different tastes and outlooks, which means that it will be of interest to see if poker firms will be looking to provide different offers. Sometimes these offers may be acting as test drives, to see if a particular style of promotion works better than another. At other times different promotions will be aimed at giving a local feel or a specific flourish to a poker site in a certain state. Anyone that is keen to explore the different style of promotions will have an eye on what the Ultimate Poker site is rolling out to players this month. In December, poker players in Nevada and New Jersey will be recipients of particular poker bonuses. Players in Nevada will have the chance to pick up a $100 reload bonus. Players will need to deposit a minimum of $100 before the end of year to earn their bonus. Players will also need to collect at least 2,000 XPs within 60 days of receiving their bonus to be able to clear it. This works out as equivalent of $200 in rake, which means that that bonus offer is said to be worth 50% in rakeback. Once the bonus has been earned, it will be paid into the players account within 3 days. As far as bonuses go, this is a fair USA poker online promotion to look out for. There is an added bonus for the players that manage to deposit a minimum of $100 in this time period. The site is running a $10,000 freeroll event on Sunday the 5th of January and players meeting the criteria will have the chance to enter the big game on that day. Nevada players will also have the chance to play for a share of $25,000 in guaranteed tournaments at other times on this day, allowing players to get 2014 off to a cracking start. There are certainly plenty of incentives for Nevada poker players to get online and play this month so what is on offer for New Jersey players? There will be some players that think what is on offer in Nevada sounds highly enticing but hopefully they will enjoy what is on offer in New Jersey as well. There will be daily tournaments of $1,000 on offer throughout December and these are played in the evening every day. The tournaments will be No Limit Texas Hold ‘Em tournaments and with the buy-in for these events being set at just $1, everyone can join in. The first place is guaranteed to be $1,000 so there is certainly a lot to look out for. Given that the Ultimate Poker site is one of the few sites that has a licence in New Jersey and Nevada, there will be a lot of people looking at its actions and seeing what it offers to players. There is a genuine opportunity to provide local players with something that is completely tailored to their needs. 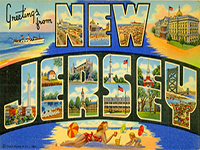 While the main game of poker is the same across the US, if not the entire world, there is no doubt that the demographics involved with people from New Jersey and Nevada can be different. This is an area where a competitive poker site may be looking to get ahead of their rivals. A poker site that is only licensed in one state may find that they have the edge because they can offer a concise and cohesive strategy but there is an opportunity for dual state providers to differentiate while being a success across the board.